This is a fundraiser to help pay for unexpected veterinary bills and disinfection supply costs due to an outbreak of a serious illness among the eight horses at Parkwood Farms. Parkwood Farms Therapy Center is a non-profit organization run by volunteers. The organization exists solely for the purpose of providing therapeutic riding to children with disabilities. Out of the eight horses at the facility that regularly provide therapeutic riding to members of our special needs community, one horse died on March 20 and four​ more have shown symptoms of a disease called strangles. This is a very serious disease and is easily spread between horses. The veterinary bills and disinfection supplies are expected to reach a minimum of $7000. 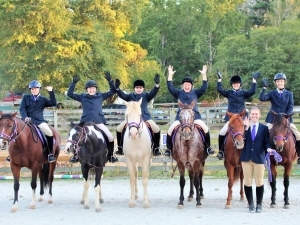 Because therapeutic riding is its sole activity, Parkwood relies on riding fees (which are kept low to help struggling families) and donations to maintain the horses and facility. Making financial ends meet can often be difficult for the facility under typical circumstances. However, the facility has never faced having so many horses so sick at the same time. Due to the fact that this disease is easily spread among horses, the farm is currently under quarantine. As a result, riding has been suspended until the horses have fully recovered, resulting in the loss of riding fees that go towards the typical care and upkeep of the animals. You can help by making a donation of any amount now. The need is immediate in order to save the horses and the entire organization. Any amount raised above the vet bills will go for feed and other essentials. Thank you so much for any amount you are able to give towards this important cause! I've known about Parkwood Farms for several years now. Dr. Peterson has become a good friend. The love she pours into Parkwood and her horses and the magic that happens for these kids when they get around these sweet horses is something to behold... Love and Magic there's no other way to describe it!